The Yesterday, Today and Tomorrow Plant. 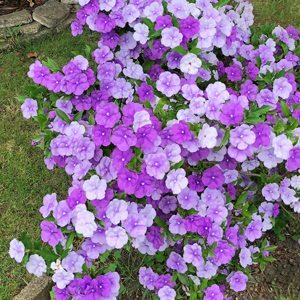 If you are looking for a small fragrant flowering plant with interesting flowers them Brunfelsia latifolia is one to consider. It is the nature of the flowers and the way that they change colours that gives it the common name of ‘Yesterday Today and Tomorrow’. Rarely reaching more than 1m in height, this compact growing small shrub makes an interesting small specimen plant in the garden or when grown in a container. it does require a frost free position, however it will flower freely as far south as Melbourne. Flowers start out purple, and through the week change to lilac and then white. as the flowers last a long time, and flowering is over a long period, they tend to look ‘multi coloured’. A well cared for plant will be covered in fragrant flowers, well worth the effort in any garden. You can grow Brunfelsia latifolia from the far north of Queensland to as far south as Melbourne. In cooler climates you will need to find a warm protected position. This is a shrub from Central America, so the need for warmth is understood. However in suburban Melbourne you will find many good examples of this small shrub. It thrives in Sydney and further north. Try a humus rich fertile soil in a protected position, away from frosts and cold winds. In warmer climates this is a plant that will flower when grown in light shade. Common Names – Yesterday, Today and Tomorrow, Kiss Me Quick. Spread – Fairly upright in habit to around .5 across. Soil – Humus rich, well drained and moist. Position – Full sun to a little afternoon shade. Flowers – Purple fading to a lilac blue and then white. Problems of yellowing foliage are usually due to lack of fertiliser, or to cold winter temperatures. Over fertilising can have the effect of goof growth and lack of flowers. Easy from softwood cuttings taken in spring, also possible from removing suckers from areas where roots have been disturbed.